LOWEST PRICES in Sydney Guaranteed ! FREE car battery delivery & installation – Within 1 hour, 24/7 – Sydney wide! We specialize in all: Car, Truck, Vans, and 4WD batteries. Get your NEW car battery at the ABSOLUTE CHEAPEST PRICE – GUARANTEED! SYDNEY BATTERIES is the name you can trust for immediate, efficient battery replacement services – no matter where you are. Regardless of the make and model of car, truck, van, or 4WD, you can count on Sydney Batteries to deliver and personally install a new battery to suit your vehicle. You don’t need to have any memberships to use the exclusive services that Sydney Batteries has to offer. With just some simple phone call, you can order your new car battery and have it fully delivered and installed within 1 HOUR – 7 DAYS per week. We specialise in mobile battery replacements for all Australian, Japanese, European, Korean and American automotive vehicles. 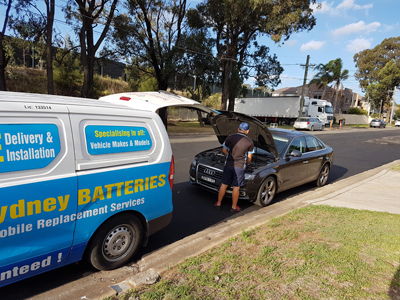 At Sydney Batteries, are committed to providing you with top quality batteries, a professional car replacement service and lasting battery results at the ABSOLUTE BEST PRICES in Sydney – guaranteed! If you can find a lower price, we will match and refund 110% of the difference. That’s how confident we are and that’s the Sydney Batteries difference! Our mobile replacement unit can deliver and install your new car battery at your preferred location. Whether that be on-road, work, home, shopping car park, or anywhere within the Sydney metropolitan region. If you need your car battery replaced – we will travel to you! Our car batteries are fully sealed and made according to the highest quality industry standards. They feature maintenance-free technology with higher rated CCA (Cold Cranking Amps), which will last longer and perform better in all vehicles. They come with a special Australian-wide replacement warranty. You simply can’t lose when you have your battery replaced with us! Our car battery prices covers complete delivery, installation, battery test, charging system test, current drain (power leakage) test, save vehicle’s memory, and disposal of your old battery. To ensure we achieve 100% satisfaction across all our battery replacement services, we provide all batteries installed by us with a 30-36-month Australian-wide replacement warranty. If our battery returns faulty during the warranty period, give us a call right away and we will have a replacement installed for you free of charge. Our mobile services unit will come to your preferred location and replace the new battery under warranty – TOTALLY FREE OF CHARGE!